Banquet, conference, display, lecture, performance, Perth, Perth Medieval and Renaissance Group, Perth Medieval and Renaissance Group display, PMRG, re-creation, Receptions, The University of Western Australia, WA, Western Australia. 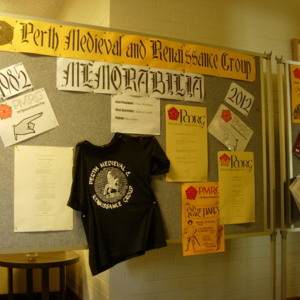 This display at the 2012 PMRG/CMEMS ‘Receptions: Medieval and Early Modern Cultural Appropriations’ conference (Perth, August 2012) celebrated the 30th anniversary of the Perth Medieval and Renaissance Group. 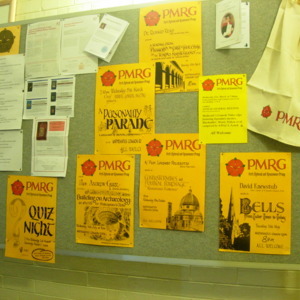 The display showed many of the posters created for past PMRG events, including lectures, quiz nights, and medieval and renaissance themed banquets and performances, as well as other items such as t-shirts and tea-towels. Since its establishment in 1982, members of PMRG have participated in a number of medieval re-enactments, including medieval dancing, stagings of medieval mystery plays and the recreation of medieval artworks in an annual Christmas party tableau. “Perth Medieval and Renaissance Group display,” Medievalism in Australian Cultural Memory, accessed April 25, 2019, http://ausmed.arts.uwa.edu.au/items/show/1004.